One of the lesser known parts of the German tax system is simply called the “ZM”, which stands for “Zusammenfassende Meldung”. For anyone running a business in Germany, it is another form to fill in on a regular basis. It all has to do with the VAT (Value Added Tax) system within the European Union. Put quite simply, if you buy something in a shop or pay for a service, then you pay VAT. For consumers, that’s the end of the story. The shop owner or service provider pays the VAT on to the tax office. At the beginning of 2011 I wrote about how the Lohnsteuerkarte was going to be replaced by an electronic system, the ELStAM, and for the past 12 months anyone arriving in Germany has no longer received their Lohnsteuerkarte on arrival when they register at the Einwohnermeldeamt, but instead has had to apply for written confirmation of their tax status at the tax office (Finanzamt). One of the first places for anyone arriving in Germany to live has to go to is the Einwohnermeldeamt. Having registered an address and applied for the relevant permits to stay in the country, new residents used to receive their Lohnsteuerkarte – a card that shows the details that an employer needs to calculate income tax deductions, such as the tax class (Steuerklasse), religion and the number of children in the family. 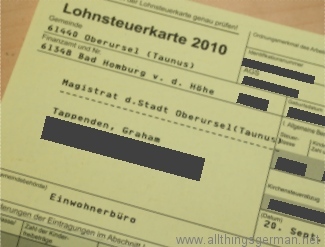 The Lohnsteuerkarte was valid for one year, and the new card for the coming year used to be sent out around the end of September.